Feature photo: Alaska Airlines’ social care team is based in Seattle and is responsible for monitoring Alaska’s social media channels and responding to customer service needs 24/7. 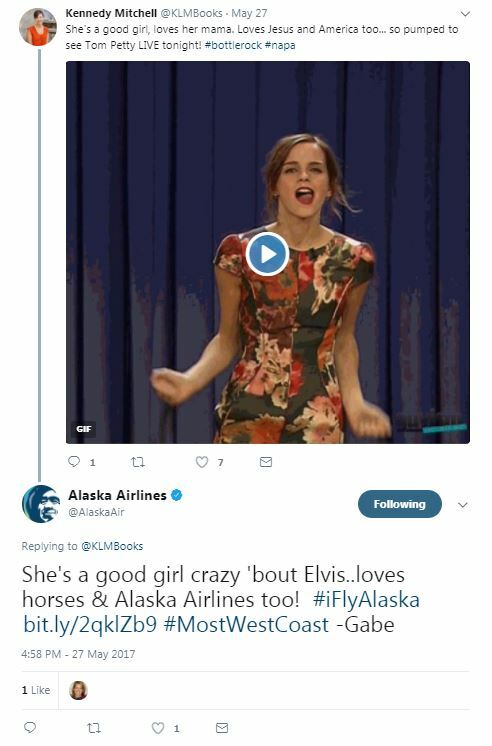 Social media never sleeps, and neither does Alaska Airlines. Whether it’s assisting a guest with a mileage request or responding to inquiries about a storm on the East Coast, Alaska Airlines social care is a 24/7 operation. It’s a team of 12 people, with rotating shifts, responding to hundreds of inquiries throughout the day and the night – all in 140 characters or less, and all in a social media minute. To many, this may sound like a near-impossible feat, but for an Alaska Airlines social care representative, it’s just another day on the job. Gabe Oronia is an Alaska Airlines customer care representative, who has worked on the social care team for three years. While his primary responsibility is to assist guests on Alaska’s social media channels, he also assists customers via phone from the airline’s Seattle-based Call Center. If you’re a frequent flyer or an Alaska Airlines super fan, chances are you’ve had a conversation with Oronia and other members of the social care team. They’re the people behind the tweet responding to you about the status of your flight; they’re the ones commenting on on your Instagram photo of a winglet, or wishing you a nice trip on your Facebook status. Unlike bots, Alaska Airlines social care representatives are indeed human and need things like sleep, coffee and time with their friends and families. Social media has provided a way for airlines to quickly address customer service needs. 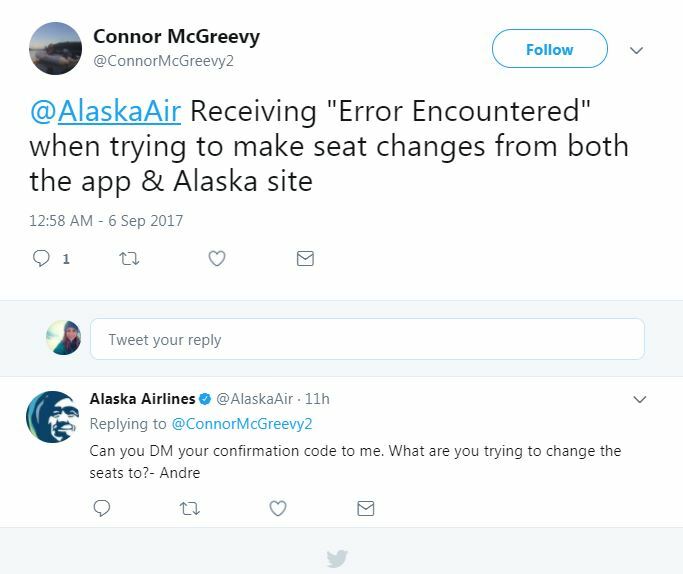 Alaska Airlines has embraced these changes and uses social media as an extension of its Customer Care program. You can still call the Alaska Airlines Customer Care team with a question or an issue, but if it’s after-hours or you’re, say, on an airplane, you can still reach a friendly customer or social care representative as your needs arise. According to Conversocial’s Airline Benchmark Report, the average social media response time across the airline industry is 1 hour and 5 minutes. But at Alaska, the social care team aims to respond within 15 minutes of initial contact, and is typically much faster, with an average response time of just 2 minutes and 34 seconds. But, Roy notes, speed is not always everything. Responses also need to be accurate and communicate Alaska’s kind-hearted service. Balancing quick responses, with attention to quality and detail, is what sets Alaska apart from the rest of the industry. Earlier today, the Alaska Airlines customer care team won Best in Airline Customer Service in the SimpliFlying Awards 2017 for Excellence in Social Media. The worldwide SimpliFlying Awards are the longest-running awards celebrating airline marketing successes on social media. 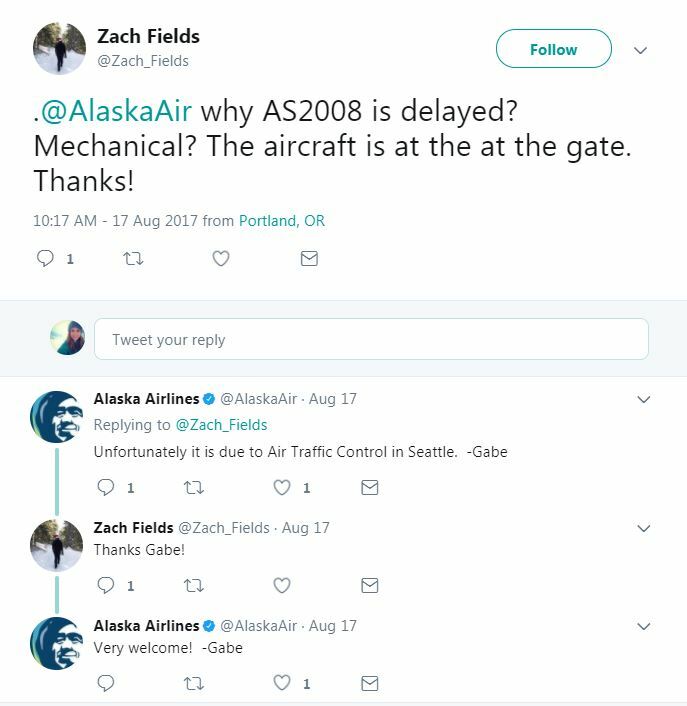 With such a limited space (tweets are restricted to 140 characters), some might think it’s difficult to communicate the genuine, caring service that Alaska Airlines is known for. But from the very beginning of its social care program, Alaska Airlines placed a heavy emphasis on using real people to have real conversations. When it comes to creating that personal connection, it’s the little things that count. Every tweet or comment is signed with the responding agent’s first name. And some agents, like Oronia, take the time to write down a guest’s name when assisting with an issue, so they can make the conversation more personal and friendly – much like the customer service employee scanning your boarding pass, or the flight attendant greeting you as you board the plane. One such insight, according to Oronia, comes from his knowledge of popular culture references, like memes, movie scenes and even song lyrics. Oronia recalled a particular time, when Alaska Airlines was sponsoring the BottleRock Napa Valley Festival, that he inserted himself into a conversation about Tom Petty. While the Alaska Airlines social care team sees their fair share of winglet photos and kudos for exceptional employees, they also have to face the challenges of the industry head-on. Travel can be stressful and even though Alaska Airlines has worked hard to make the travel experience hassle-free, things like weather and air traffic can cause unavoidable delays. Explaining this within the confines of a tweet can sometimes be difficult. In these irregular operation situations, the incoming tweets and comments can stack up, meaning agents have to juggle multiple issues at one time. While Oronia is waiting for Alaska Airlines Central Baggage Service to locate a guest’s bag, he may also be checking the status of a flight for another guest, while also helping another with their Alaska Mileage Plan account. But for Oronia the toughest part of his job is not dealing with the large volume of incoming tweets or juggling multiple conversations and customer inquiries at once. The toughest part, Oronia said, is when he is in a situation where he can’t help. Since January, the Alaska Airlines social care team has nearly doubled in size, largely due to the growing demand for social care, and as Alaska combines forces with Virgin America, making it the fifth largest U.S. airline. Typically, recruitment for social care comes from within its own department. Representatives who currently assist customers on the phone are encouraged to apply for the program and bring their expertise and genuine caring spirit to Alaska’s social media channels. When reaching out via social media, it’s important to keep your confirmation code private. Personal information is stored in your reservation. If an agent needs your confirmation code, they will ask you to send it to them via a direct message.